Yes, I happen to be an investment advisor myself but I’ll try to prove to you this is not some self-serving advertisement with links to SIGN UP FOR MY SEMINAR! I see it as a no-BS manifesto for the power of low fees and simple advice. The added value of being an investor with a trusted, reasonably-priced partner in your corner tends to far outweigh the monetary cost of the relationship. It may even be more important now than ever if we consider the outlook for returns in the medium-term. All scenarios below are *hypothetical* and all numbers are *estimates*. Notice there are a lot of things that subtract from your returns, but none that add to it besides the return from markets? Now you see what I’m getting at and why I’m saying it pays to get someone in your corner. Let’s break it down into things you can and can’t control. Things you can control: your errors, fees and minimizing taxes. Things you can’t control: what the market returns, inflation and tax rates. Your focus should strictly be on eliminating the errors you make, minimizing fees you pay on your investments and for advice, and how to invest as much as possible in tax-deferred or tax-free accounts. No matter how much investors – professional or otherwise – try to fight it, there’s a ton of important stuff out of our control. Why is it even more important today? Let’s say a globally diversified stock/bond portfolio of low-cost index funds is expected to return 5% after minimal fund fees per year going forward, compared to a more lofty return of something like 8% as we’ve seen in the past. We must try to get every bit of that 5% as possible because we know that inflation, fees, and taxes are going to dissolve some of that 5% no matter what. In order to harness the power of compound interest, it’s crucial this return is not chipped away any further. An “average” investor, one with roughly normal intelligence and investing knowledge, may try to get that five percent without help from an advisor – “cut out the fee and do it myself!” Smart, right? Well, not really. We know that the average investor hurts their own returns – those errors we were talking about earlier – to the tune of roughly 2% per year. It’s easier than ever to do something damaging as an investor because there are so many shiny new tools, products, and gimmicks available at the download of an app. The phenomenon of sabotaging our own returns is known as the behavior gap. It’s the difference between what the market returns and what an investor gets after adjusting for doing return-damaging things. 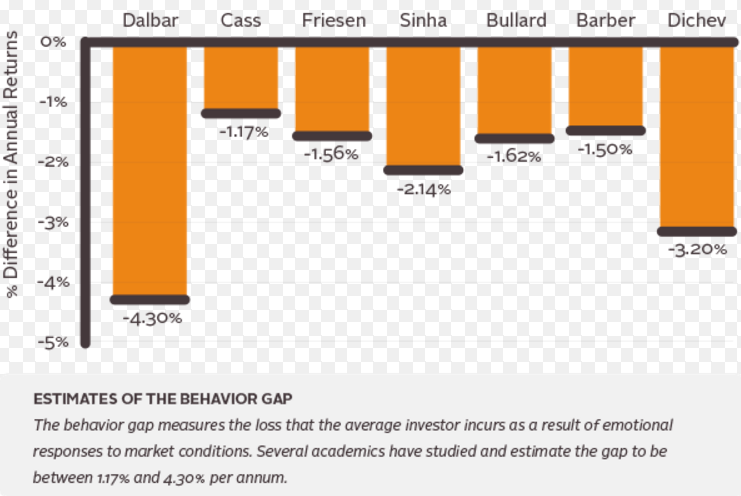 Estimates of the behavior gap. Photo courtesy of @investerasmart on Twitter. So now a do-it-yourselfer who started with an easy 5% has acted like an average investor and sabotaged their returns and paid a penalty of losing 2% from the 5% they could have had with almost no effort. Now they’re left with a 3% return. But what about the cost of their investment? If they chose active investments – read: expensive – then we can assume the fees they paid on their investments could be around 1% more than passive index funds. Now our investor has a 2% return. I’m also being generous and not calculating the effect that active investments are proven to perform worse than passive investments. What about inflation? Well, inflation has been averaging about 2% per year and is expected to remain low for quite some time as the economy deals with the potential reality of lower global growth. Our investor, after seeing a diversified portfolio of stocks and bonds return 5%, is now left with exactly ZERO gain in purchasing power for his/her efforts at investing. His/her behavior combined with high fees and inflation has left them no better than a year ago. 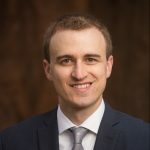 So why utilize an advisor? Simple: eliminate the behavior gap and ensure fees and taxes are minimized wherever possible. Instead of a portfolio of active funds, a wise advisor will recommend inexpensive index funds – bringing those fees down from the estimated 1% to around .20% (if not lower). 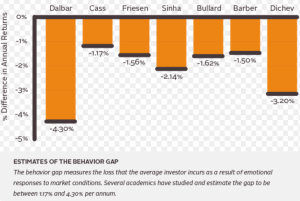 Next, the behavior gap can be reduced, if not eliminated altogether and would add an expected 2% return to an investor’s portfolio each year that would otherwise be hurt by an average investor’s behavior. Conclusion: an average investor, who hurts his/her own returns with detrimental behavior and expensive/underperforming funds may very well be in dire need of professional help (especially) if returns are to be lower than average for an extended period of time. The tailwind of high stock/bond returns will no longer be able to mask these inefficiencies, putting the average investor in a very tough spot. Saving for retirement with a low-to-zero real return will be a tough task to accomplish if an investor decides to go it alone. Even shorter conclusion: keep fees low, hire somebody to stand between you and bad decisions.